Today’s astronomy lesson is a tasty one. Fruity, to be exact. 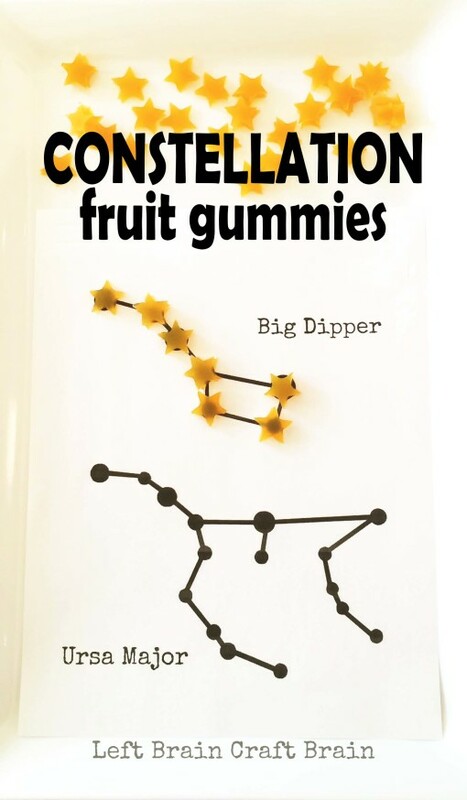 These Constellation Fruit Gummies give kids a chance to identify their constellations with star shaped fruit gummies, made from scratch. Plus, there’s a free printable… It makes a perfect snack for that after-schooling STEM learning session. This post contains affiliate links. 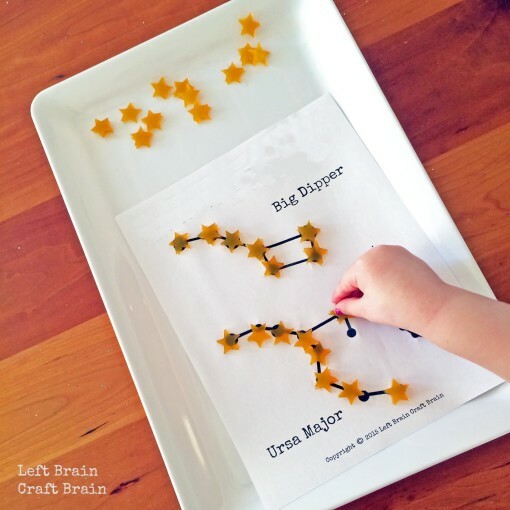 To do this activity, print out the free Constellation Fruit Gummies Printable and make the fruit gummies. In the Constellation Fruit Gummies Printable you’ll find 8 different star patterns, chosen for their visibility in the sky and for their notoriety. Oh and for how many stars they have. Sagittarius is a pretty cool looking constellation, but your kiddo would never eat dinner because there are so many stars in it. Now then there’s the Big Dipper. I learned something while compiling these printables. The Big Dipper isn’t technically a constellation. 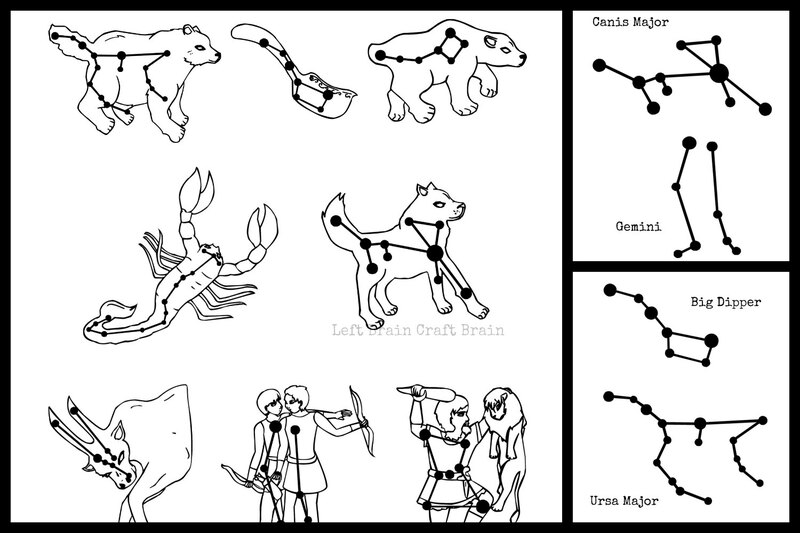 Since it’s actually a part of Ursa Major (The Great Bear), it is an asterism. An asterism is what astronomers call interesting star patterns that aren’t constellations. I decided to include it because it’s often the first (and sometimes the only) star pattern that kiddos can easily find. Pour 1 1/2 cups of juice into a small sauce pan. Heat over medium heat until it reaches a gentle boil. While juice heats, pour remaining 1/2 cup of the juice into a small bowl. Add gelatin and let bloom for five minutes. Add gelatin to heated juice and stir until fully dissolved. Take a quick taste of the juice mixture. Is it sweet enough for you? Add honey and stir until it is. Chill for 1-2 hours and remove from pan by pulling out gummy in one piece by running a knife along edges. Then place on a cutting board and cut into stars using your star cutter. The remaining non-star scraps can be cup up into pieces and eaten. Store in refrigerator for up to 3-4 days. 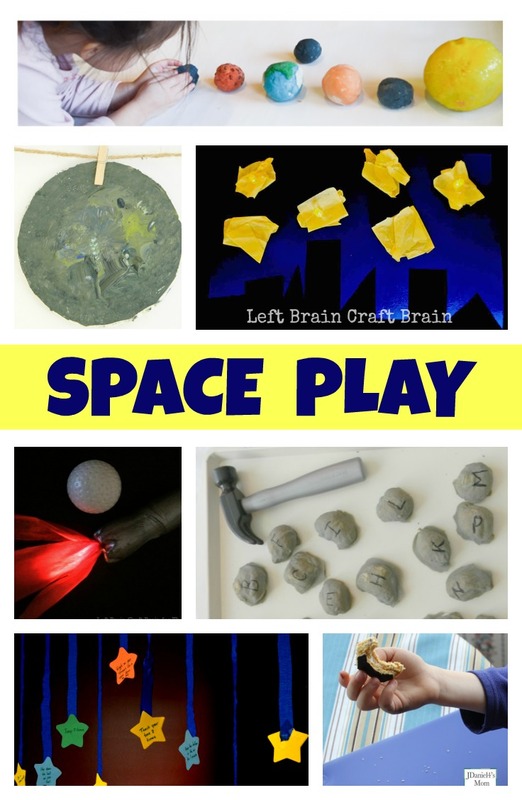 Looking for some more outer space play & learn activities? Here are some shared by the Love to Learn Linky crew of bloggers. Starry Night Electric Collage from Left Brain Craft Brain. Alien Planet Sensory Painting and Smashing ABC Moon Rocks from Stir the Wonder. Solar System Play Dough from a Little Pinch of Perfect. Moon Pie Moon Cycle Activity from JDaniel4’s Mom. Under the Stars Gross Motor Activity from Growing Book by Book. Such a neat idea Anne! My son has been obsessed with all things space lately – we just picked up a cardboard box from Home Depot the other day to make a “rocket ship” at home. We will have to try this for sure! Thanks for the great idea! I love the constellation activity and printable! We haven’t talked about constellations yet, so this will be perfect. Thanks for including our play dough activity in today’s post. Love your planet play dough! It’s been fun introducing space stuff to my daughter this month. This is such a cool snack activity! Thanks for featuring our space themed activities!